The Canadian World Friendship Fund is an initiative designed to support projects in developing countries to improve the lives of girls and their communities. The CWFF also offers financial assistance to members representing Canada in international events. There is an Alberta Council crest, that can be earned by contributing to the fund. The activity packages for World Thinking Day 2019 are now available to download! The World Association of Girl Guides and Girl Scouts (WAGGGS) is a global association that encourages girls and young women to develop their fullest potential as responsible citizens of the world. 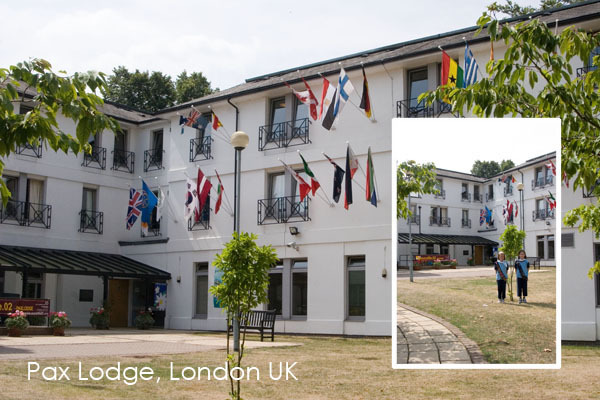 There are five world centres around the world which support travel among WAGGGS countries. Check this page regularly to find resources to help Guiders share the world outside of Canada with their units! What can the International Adviser and the International Committee do for you? - Help with girls & Guiders with applications for Nationally/Provincially selected events. - Help units with independent travel plans and forms. - Presentations to units or councils at all levels about international travel, WAGGGS, Global issues and more. - Provide International program ideas for all levels. -Area Thinking Day Event Each February! -Fall Area International Fair & Information night. Remember International can be done in your program all year round, not just in February! Do you want someone who has travelled within Guiding, to an international camp, world centre or on an independent trip, to come and talk to your unit about their travels? Just contact the area International Adviser and she can help connect you to some amazing Girls and Guiders who’d love to share their experiences and inspire your girls! For more information and fun ideas about Guiding around the world, check out these other websites. These Instant Meetings have ideas from different countries for crafts, games and recipes for all age levels. New countries will be explored each month! Try to disconnect from your devices. Watching YouTube videos and chatting on social media is great, but remember to look up and enjoy where you are visiting. To avoid being hassled, walk confidently with an air of purposeful alertness, and dress in clothes that blend in with the crowds. Pack as lightly as you can, as you will acquire souvenirs and extra stuff as you travel. Winter travel can be a frequent contributor to the cold and flu time of year, adding a miserable element to your winter or holiday travel stress. Before you leave, visit your doctor's office to get a flu shot and make sure to wash your hands or use hand sanitizer frequently. Bring gaffer tape with you. You can put it over the top of sun screen/shampoos while travelling to avoid leaks. It is also handy for breakages and preventing blisters! Unless your travel dates are absolutely set in stone, use flexible date searches for flights. Just about every flight website offers the feature - in which you can retrieve prices for a few days before and after your selected dates. It tends to be cheaper to fly on days other than Friday and Sunday, but don't assume anything. Flying just one day earlier or later than your ideal date could mean saving an easy $100. Always bring a photocopy of your passport on trips. If you should ever lose your passport, having a copy greatly expedites getting a new one. Scanning it and emailing it to yourself works just fine. Travel insurance is worth purchasing for big-ticket trips that are largely non-refundable. The typical plan will cover emergency medical expenses and baggage loss and delay, and recover at least some of the cost of your trip if your vacation has to be canceled or cut short (the amount is partially determined by where you live), including if the travel operator goes out of business. Keep a diary. It is very easy to forget the amazing things you have done, and it gives you something to do on long bus/train/plane trips. Treat your feet well! You will be walking, running, and standing on your feet for your entire trip, so bring comfortable and sensible shoes. Bring a pack of cards, as they can keep your group entertained during any delays or waiting periods and they are a great cross-cultural barrier breaker! When flying (especially long haul) bring an extra top, as the blankets provided are fairly thin and planes can get quite cold! Whenever you get up to leave somewhere (airplane, restaurant or anywhere) turn around and make sure you haven’t left anything behind! When booking flights and hotels online enable private/incognito browsing. Travel sites often track your visits and will raise the price simply because you have visited before. Avoid packing jeans. They are bulky absorb dirt and odours and they take days to air dry. Cotton and khaki are much better choices! Travelling can confuse and distress your body, so make sure to treat yourself well. Get enough sleep, stay hydrated and eat healthy to help adjust to new place! When flying, make sure electronic devices (cell phones, laptops or electronic games) are charged and ready to be turned on for inspection. You will not be allowed to take them on board the plane unless they are functioning. Bring two swimsuits when travelling to the beach, so one is always dry. They are small, lightweight and take up little room in a backpack or suitcase, so packing more than one is a comfortable decision. When packing delicate items (such as evening wear), try tissue paper. Lay the item face down and place tissue paper on top. Fold it up with the tissue paper inside. Use additional layers of paper as you fold the garment so it is completely wrapped in and around paper. Note: This is easy enough the first time you pack, but becomes a pain if you have to keep repacking. Put patterned tape or unique luggage tags on your bags to make them easier to identify! When travelling with extra shoes, stuff socks into them to maximize the space in your bag!